Two weeks ago, the Green Bay Packers were eliminated from playoff contention. A few hours ago, the Seattle Seahawks joined them. This is the first time in nine seasons that both of my football teams will be watching the entire postseason as spectators. In hindsight... it was a pretty solid run and in terms of power rankings, both of these teams easily trump the two baseball teams I actively root for. To put things into perspective, during the past nine seasons, each football team has won a Super Bowl and the Hawks were potentially one Marshawn Lynch handoff from winning another. The Green Bay Packers won the NFC North five times and made the playoffs eight consecutive years. The Seattle Seahawks won the NFC West four times, made the playoffs six times, and earned trips to back to back Super Bowls. The Oakland Athletics had a decent team a few years back when they won the AL West in 2012 and 2013. The following year they had the best record in baseball heading into August, yet somehow managed to have an epic meltdown that resulted in a 12th inning loss to the Kansas City Royals in the AL Wild Card game. They have finished in last place in the AL West ever since. 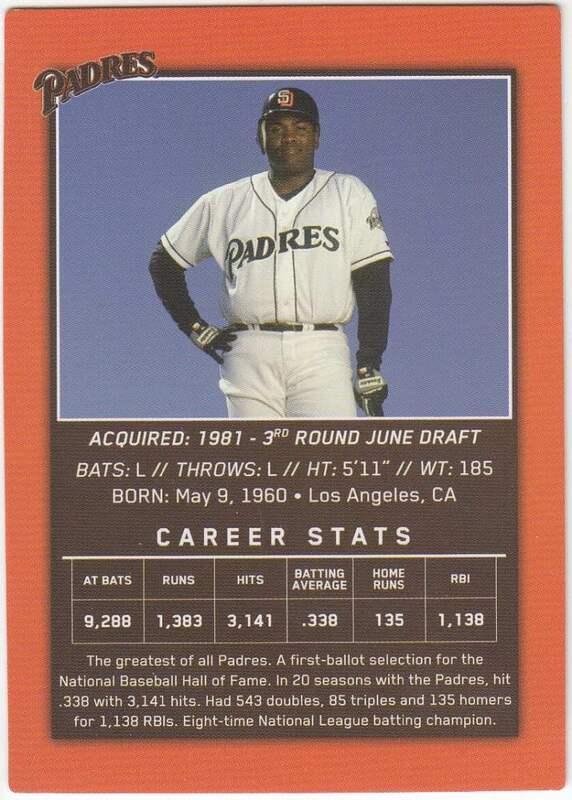 Then there are my beloved San Diego Padres, who are by far the worst team I cheer for in regards to team success. Over the last nine seasons, they have had exactly one winning season with zero playoff appearances. In fact the last time they made the postseason was 2006 when Jake Peavy was still their staff ace, Trevor Hoffman was their closer, and Mike Piazza was their starting catcher. Mike Piazza. But that's okay. I still love them. 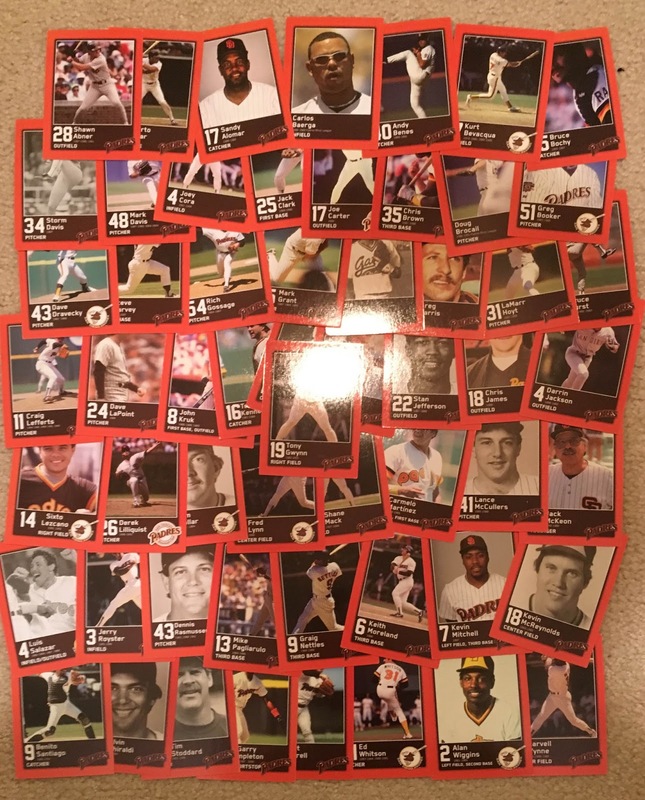 And Rod over at Padrographs gave me almost 200 reasons to continue being a loyal San Diego Padres fan. Let's kick things off with a stadium giveaway set that was handed out to fans who purchased special tickets to the August 19th game versus the Washington Nationals. 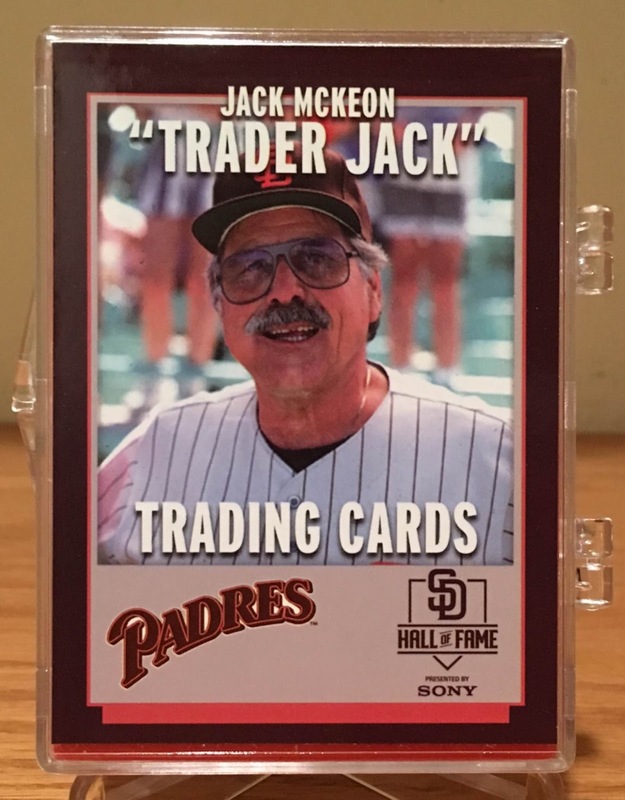 Jack McKeon was the general manager for the San Diego Padres during the 80's when the franchise made their first World Series appearance back in 1984. 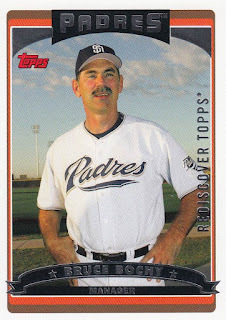 That day the San Diego Padres inducted him into their hall of fame. 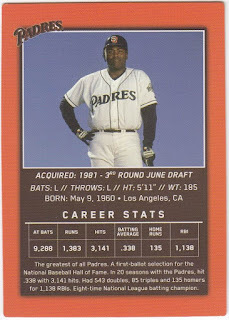 The set's checklist seems to be centered around the guys who played on the Padres during the Trader Jack ERA. I really like the design the Padres decided to go with. It's simple and features the mid to late 80's brown and orange color scheme. The only downside is that there's no production year printed anywhere on the card, so collectors who stumble across singles in the future might have difficulty determining what they're holding. James Needy (left) is a former San Diego Padres prospect who is now with the Miami Marlins. The Matt Szczur is a custom card that Rod produced and had signed back in September. 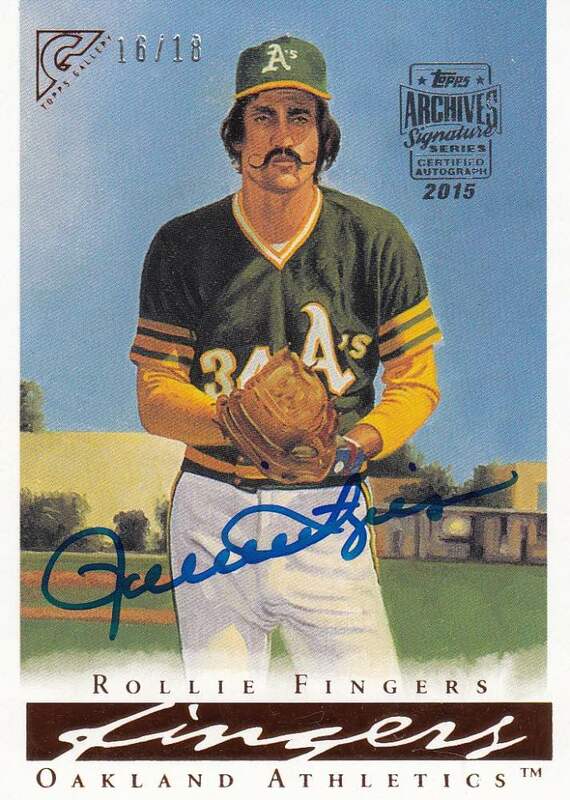 You can read about his TTM experience here. And Ian Kennedy started 73 games for the Padres a few years back. Renfroe broke the San Diego Padres rookie home run record previously set by Nate Colbert back in 1969. Only Wil Myers hit more home runs for the Padres last season. 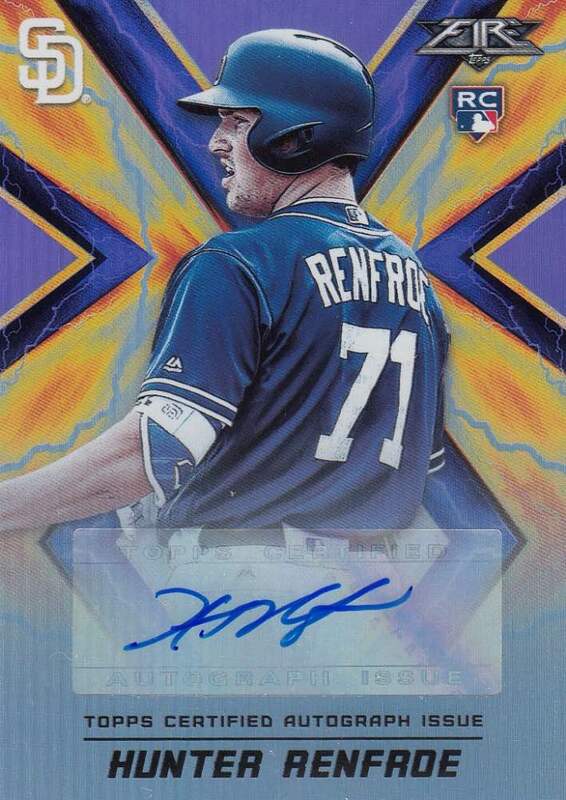 Unfortunately, Renfroe's batting average and on base percentage were pretty low. He'll need to work on that if he hopes to become the Padres' future #3 or #4 hitter. 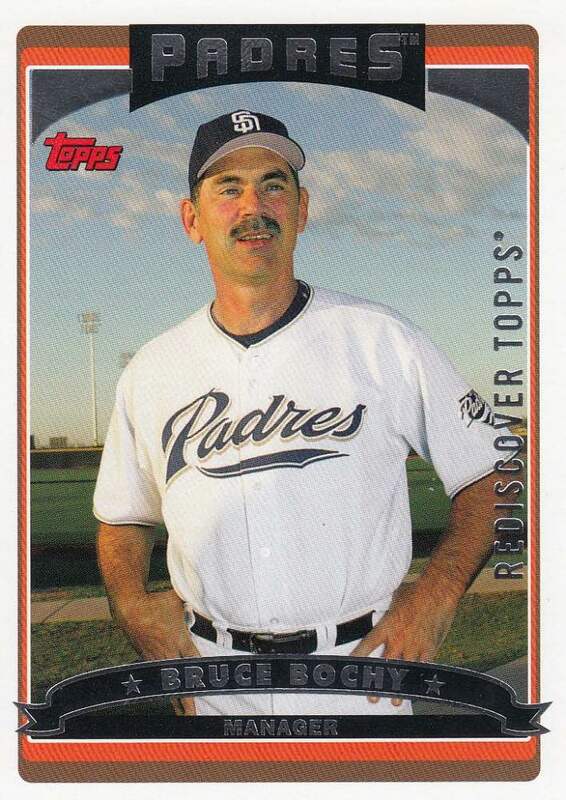 Bochy is the last Padres' manager to take the team to the playoffs. He left the team after the 2006 season to manage the San Francisco Giants. Since that time, he's won three World Series titles with them. 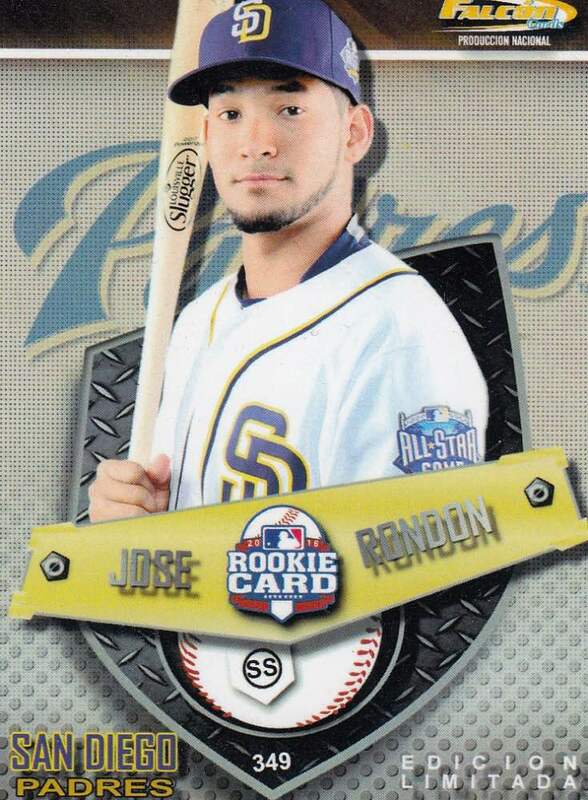 But look how young he looked when he was with the Padres. He's hella aged in San Francisco. 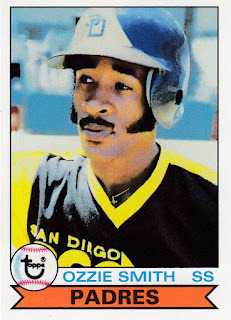 I always enjoy adding a new Ozzie Smith card to my binder... especially when he's wearing the famous Brown and Gold. Zippy doesn't have the market cornered on Torrens rookie cards. Thanks to Rod, I finally have a copy for my collection. 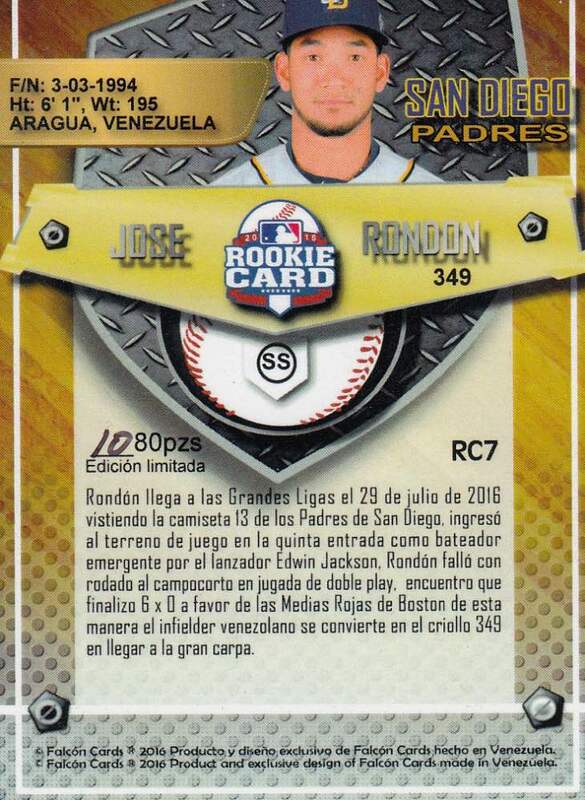 Jose Rondon isn't the mystery. He's a Venezuelan shortstop who spent most of 2017 in San Antonio (AA) and El Paso (AAA). The mystery is the card itself. Anyone ever heard of Falcon trading cards? 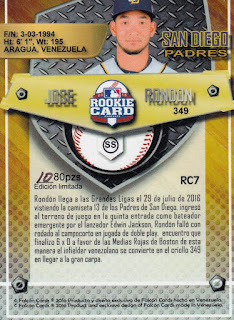 It looks like a Venezuelan trading card from 2016, but contains official MLB logos. Is this an officially licensed trading card or a really nice custom? Was it distributed in packs? Sets? Any help would be appreciated. Rod also hooked me up with a small stack of A's cards too. 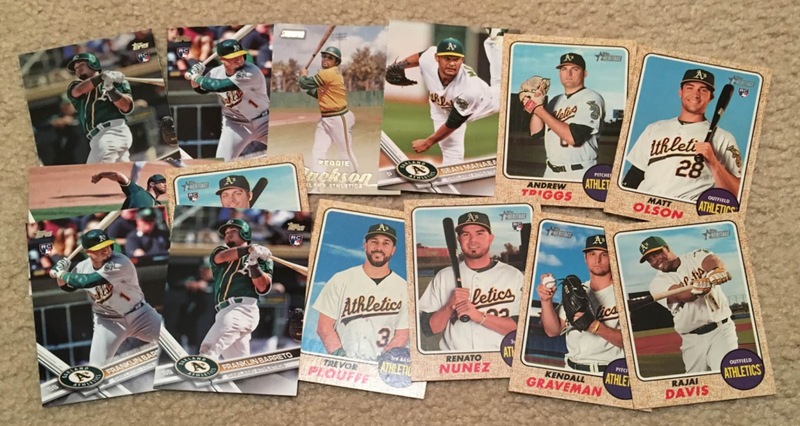 There's a sweet looking Reggie and a few rookie cards of the Athletics' top prospect: Franklin Barreto. Thank you Rod! 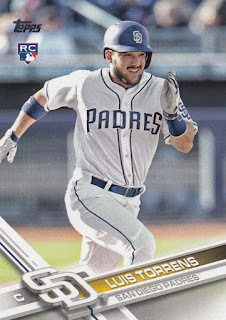 I'll try to scrape up some San Diego Padres for your collection. I think I might have a few autographs laying around. Hopefully they'll fit into it somewhere. 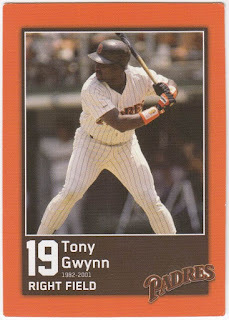 As for the Padres... they'll forever be my National League team. I mean... somebody has to stick around and love them, right? Happy New Year's Eve and sayonara! 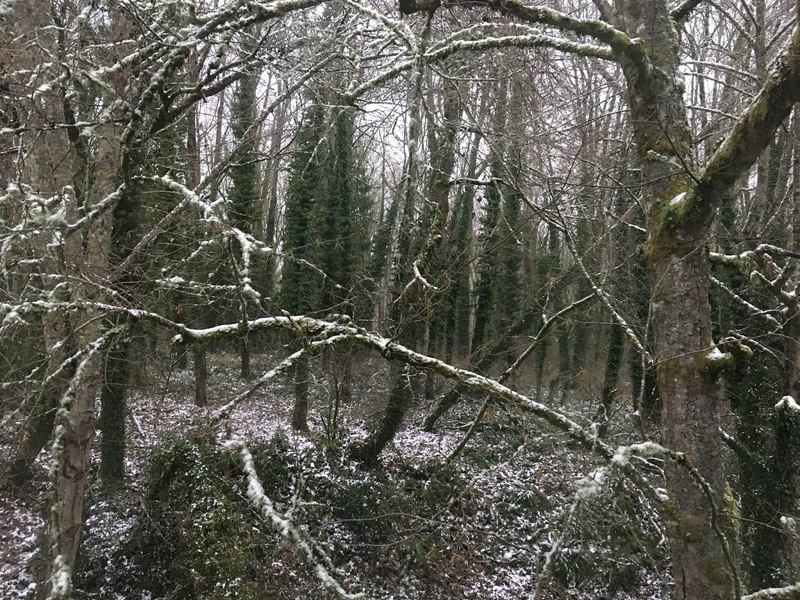 Since I returned from my trip to Oregon, I have spent the majority of that time sleeping, laying in bed, and occasionally watching tv under layers of blanks on the couch. Sounds heavenly, right? Nope. It's been miserable. It's been a few years since I've been this sick and hopefully I won't go through this again for another few years. The good news is I'm feeling a lot better. If I were to assign a number to it, I'd say that I feel 70% better than I did when I woke up Tuesday morning. I'm coughing a lot less and the headache is gone, but I'm still producing some phlegm. Luckily I'm smack dab in the middle of my holiday break, so I have the luxury of treating this cold the right way. Hopefully I'll be well enough to walk around and do a little holiday cleaning by tomorrow. The thing I look forward to the most is sitting down and opening up the stack of care packages I had been saving for Christmas. 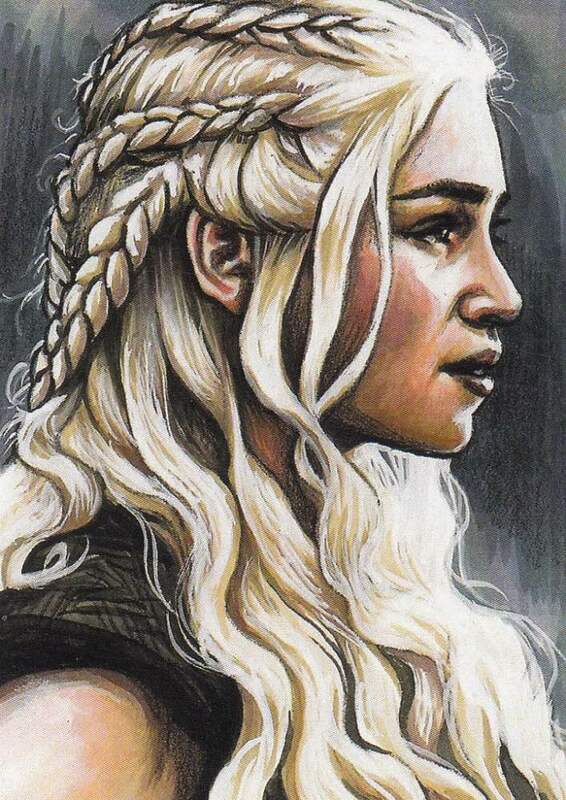 The day I left for Oregon, I did manage to open and scan a Christmas PWE from Jon over at A Penny Sleeve For Your Thoughts, which contained the beautiful card of Daenerys Targaryen pictured above. According to Jon, the card is part of a 10 card set featuring the artwork of Ashleigh Popplewell that was only available at the 2017 Philly Non-Sports Card Show. There were 100 sets produced and this card represents the only Game of Thrones card in the set. As a bonus, Ashleigh took the time to sign each of the cards on the back. Thank you Jon for the very cool Christmas present. I appreciate you taking the time to think of me and my fascination of Game of Thrones. I'll look through your wantlists to see if I can return the favor as soon as I get back on my feet. I'd like to start of this post by saying thank you to everyone who sent well wishes to my mother. The surgery was a huge success and although she's in a lot of pain, she's been moving around, getting in some exercise with the aid of her walker. She still has a ways to go, but at least she's headed in the right direction and the family was able to breathe a major sigh of relief. With the exception of rushing to my sister's house for a quick shower on Tuesday afternoon, my father has been at my mom's side the entire five days. It's the kind of thing I imagine you'd find in romance novels. 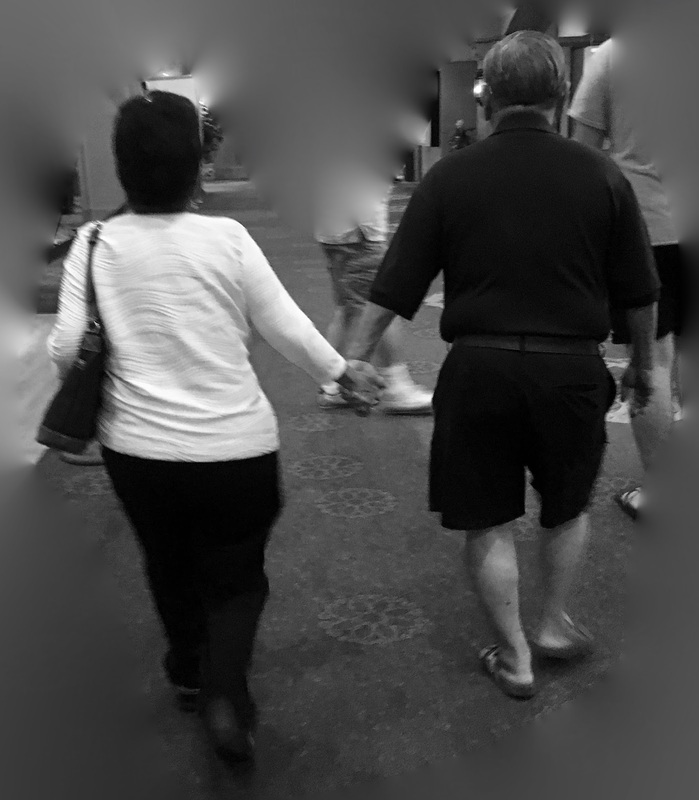 Anyways, I'm very fortunate to have a father who is mentally and physically capable of helping my mother through this difficult time. I'd also like to acknowledge my sister and her family who have been there to help as well. I considered flying down to Arizona to be with them, but I've been dealing with a terrible head cold the past few days and the last thing I need to do is get everyone sick. Plus my parents will need someone to be there for them when they leave Arizona and head back to Las Vegas. That's when my brothers and I will be there for support. Okay. Enough family talk. Let's shift our focus to baseball cards. Today I wanted to show off a card that has sat on my mental want list for almost two decades. 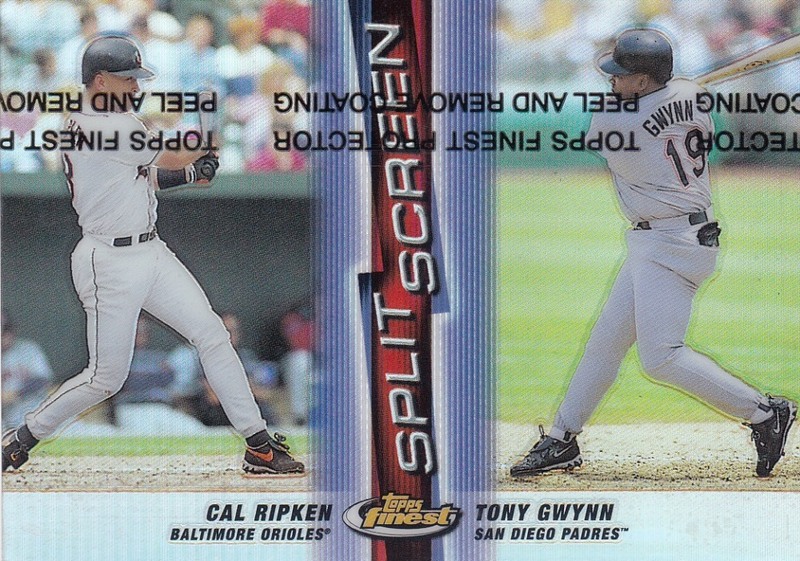 Back in 1999, Topps produced a Finest insert set that paired up either two teammates or two players who had similar career paths called Split Screen. 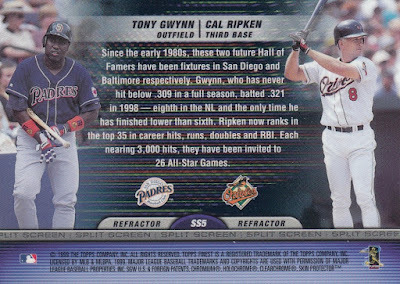 One of the cards on the checklist featured baseball's Iron Man paired up with my favorite player of all-time: Mr. Tony Gwynn. These two guys might have played different positions and in different leagues, but they also had a lot in common. Both of these guys kicked off their MLB careers in the early 80's. 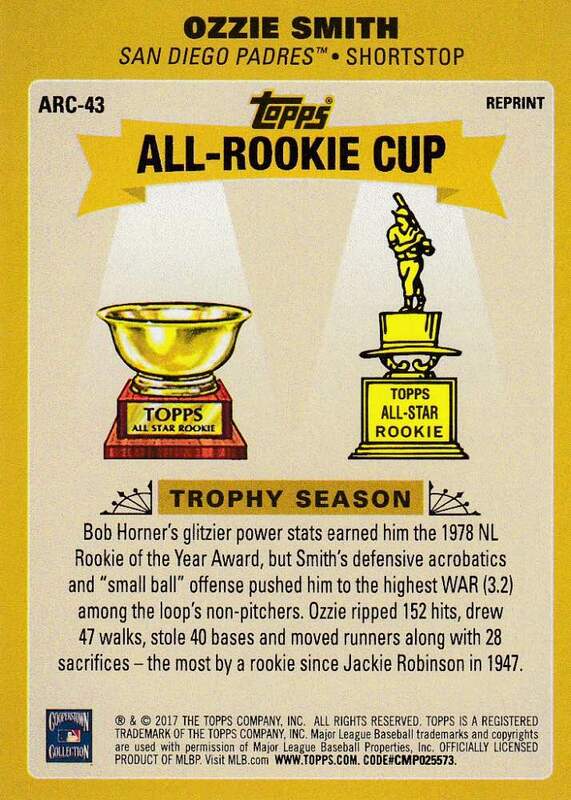 Both were perennial all-stars. Both collected 3,000 hits. Both were loyal to one franchise their entire career. And both are first ballot hall of famers who were enshrined into Cooperstown together in 2007. I paid top dollar ($7.75) for this card, but have absolutely zero regrets. It features two iconic baseball players from my childhood on a single card that utilizes the Finest refractor technology. It doesn't get much cooler than this. Okay... It's time to get some rest. I currently sound like a cat purring when I breathe. My body is sore. I'm coughing up chunks of sticky green goop and my head is pounding. 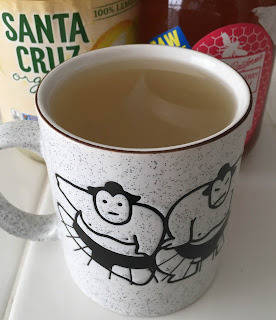 I've gotta drink some of this honey and lemon juice to help soothe my throat and hopefully pass out and let my body recharge. Lemon and honey. Mama and Papa Fuji. 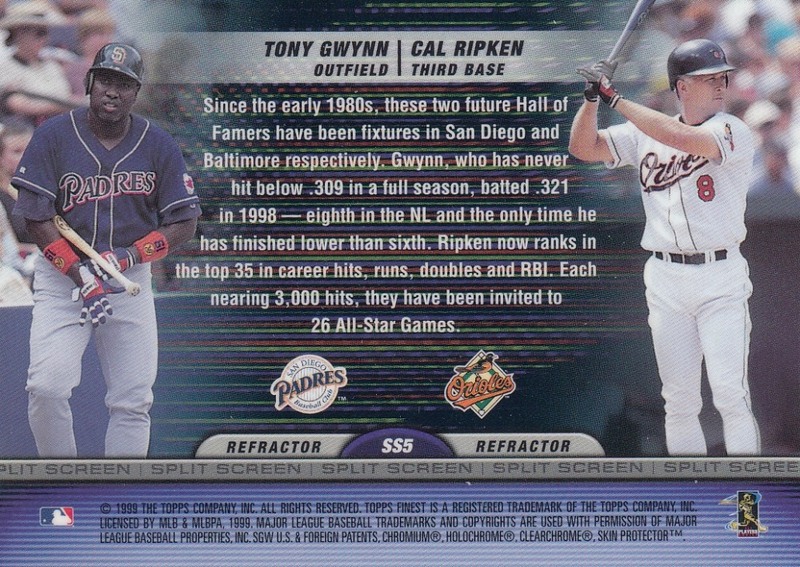 Cal Ripken Jr. and Tony Gwynn. Three very different ways to show off prime examples of "perfect pairings". Christmas break has always been an extra special time of the year for me. When I was a kid, it meant two weeks off from school. These days, it means two weeks off from work... which still happens to be a school. This year, I kicked off my break spending a few days up in Lake Oswego, Oregon with my best friend and her family. 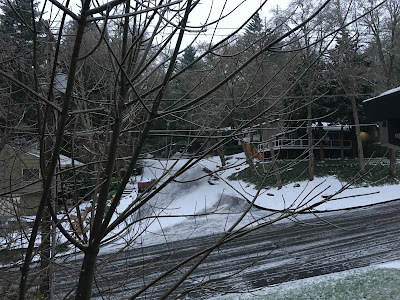 We were all hoping for a white Christmas and our wish came true after it snowed on Christmas Eve. The day before we took a trip down to George Rogers Park and were treated to a picturesque view of the Willamette River and a family of ducks. 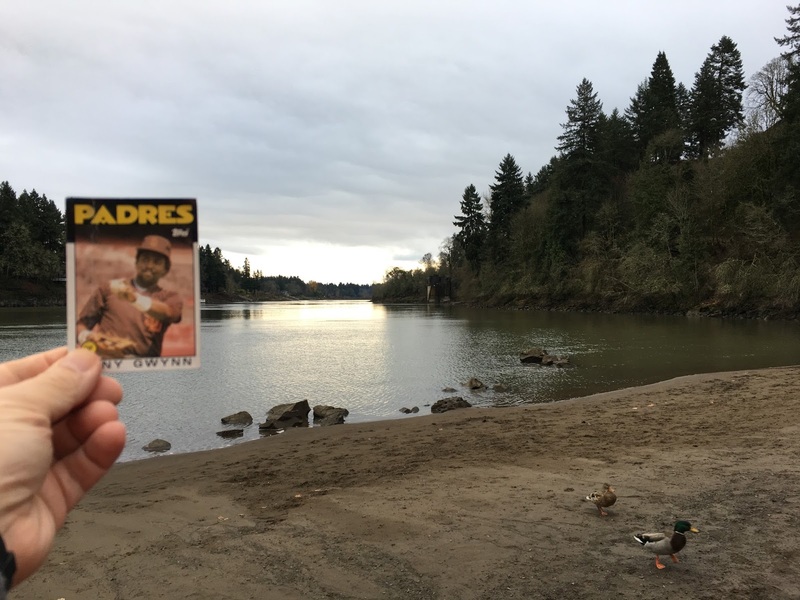 The view was so beautiful, I figured I'd share it with my wallet card who hasn't seen daylight since last year. I've been to Oregon a few times... and every time I'm blown away by how clean and quiet it is compared to California. I can't wait to go back and visit. Unfortunately my weekend wasn't entirely jolly. I'll spare all of you the small details and give you the CliffsNotes version. On Christmas Eve, I found out that my mother had fallen on Friday evening. The next day, doctors determined she had a hip fracture that required immediate surgery. Thankfully everything went smoothly and Mama Fuji is in the process of recovering with support from Papa Fuji and my sister's family. However since my mother is in her 80's, rehabilitation will most likely be an uphill battle. We're all thinking positively and she has plenty of love and support. As soon as they hammer out a timetable, I'll schedule a trip down to my parents to help my father take care of my mom. A.J. 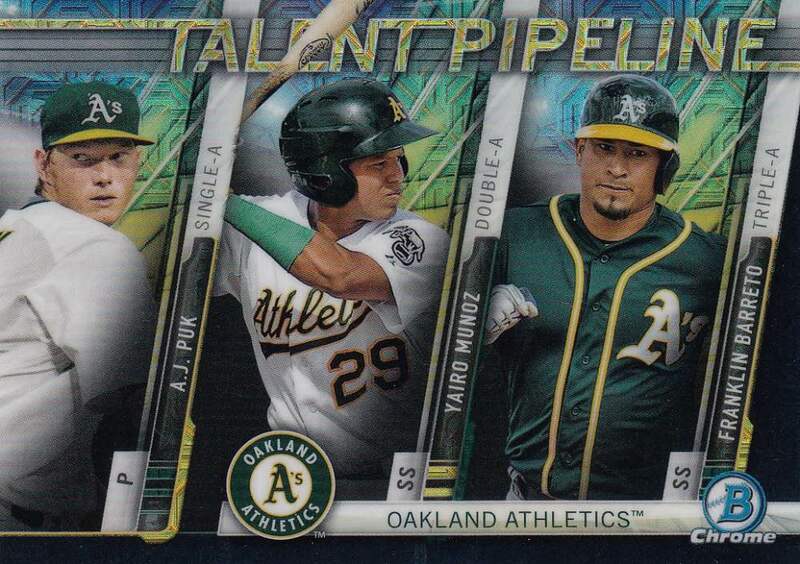 Puk and Franklin Barreto are the Athletics two top prospects. Both are expected to be called up sometime this season. Munoz was shipped off to St. Louis as part of the Stephen Piscotty trade that took place a few weeks back. 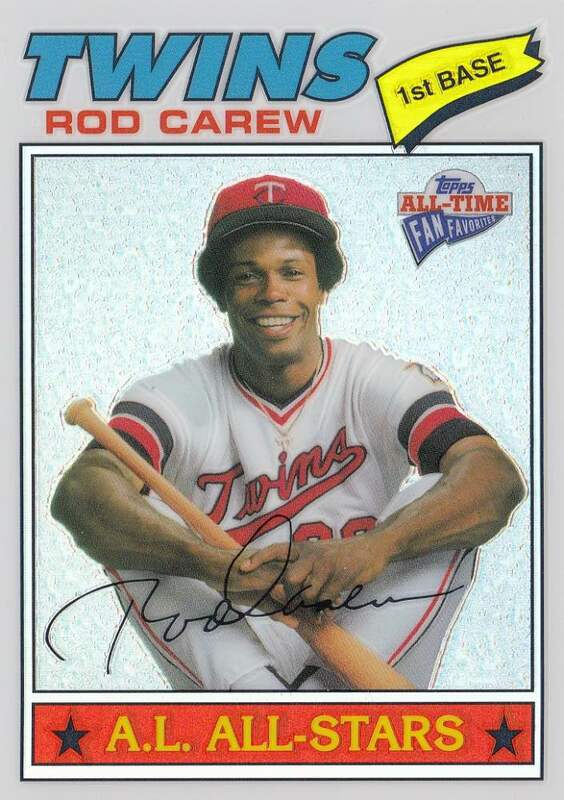 Jose Altuve and Rod Carew are two of the greatest hitters of their generation and are two of my newer player collections, which means they're both relatively small. I was really excited to add these to the collection. 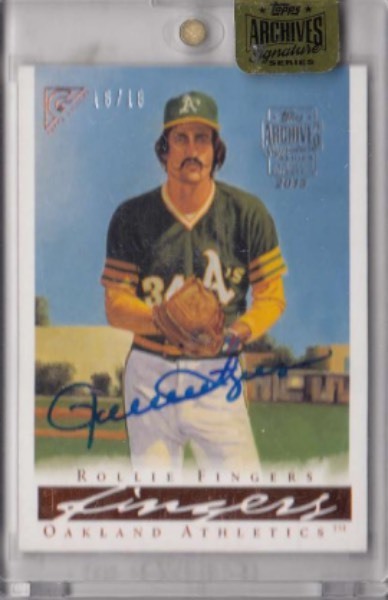 I wish I could say that I cheered for Rollie back in the 70's when he pitched for the Athletics and helped them win three World Series titles. Unfortunately... I was a little too young. On the other hand, I was a big fan of him during the early 80's when he pitched in Milwaukee. One of my childhood buddies is Rollie's nephew and he'd get together with my friend's family when the Brewers were in town. 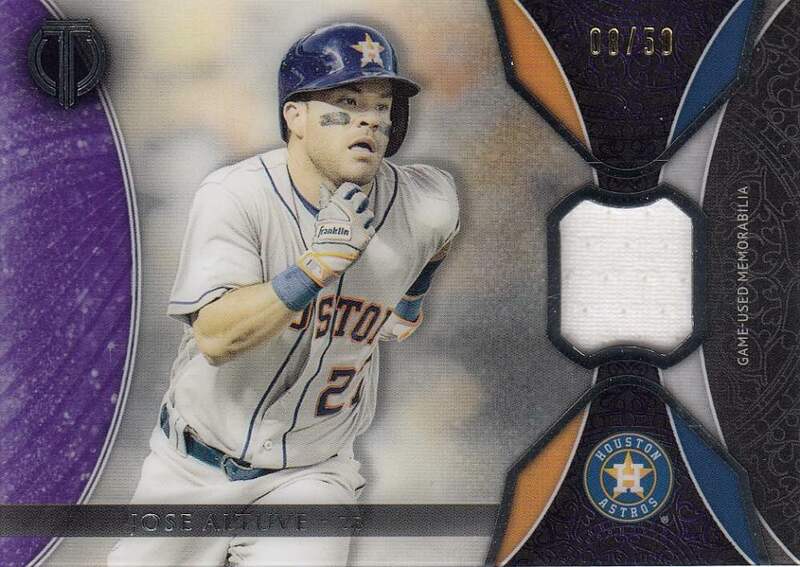 This card is sweet. It's features a shiny, dual image design, a heavy metal frame, and an on-card signature. Cotton is kind of a wild card on the team. 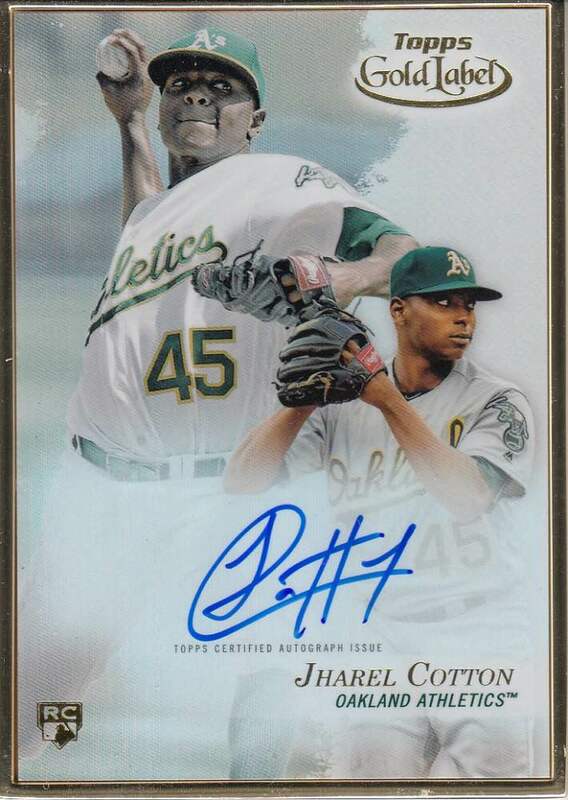 After struggling in 2017, it'll be interesting to see if he becomes an everyday starter on the A's rotation in 2018. 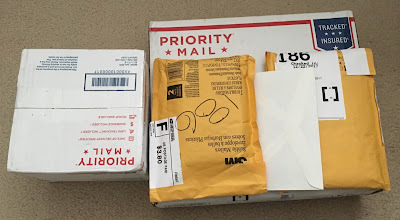 Thank you Sam for this generous Secret Santa package! 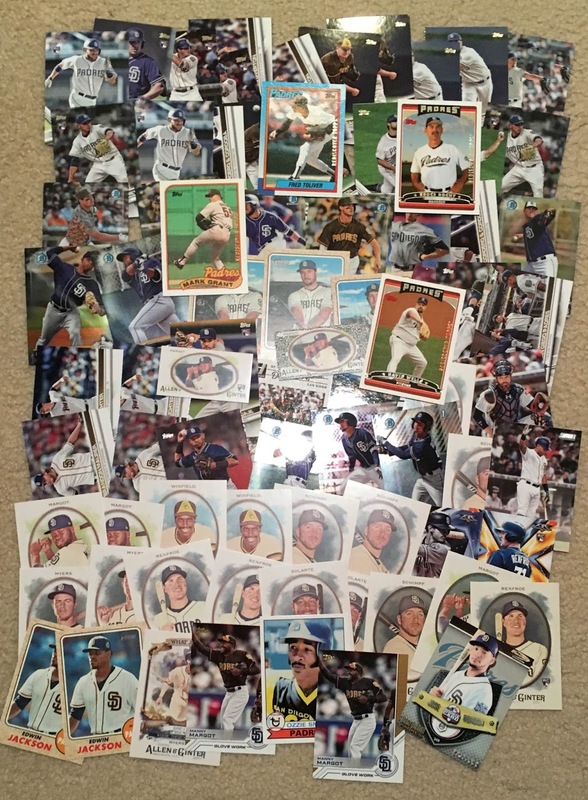 I appreciate you going through and hand picking cards for my collection. I'd also like to thank Mr. Scott for taking the time to organize another great year of Secret Santa gift exchanges during this busy holiday season. Great job buddy! I hope all of you had a very merry Christmas with your family and loved ones.